Medical uniforms are crawling with dangerous bacteria. A medical facility can be a dangerous place. Healthcare workers are surrounded by sick patients for sometimes up to 12 hours per day, putting healthcare workers at risk for the very health issues they’re trying to solve. Germs and bacteria can be transferred in numerous ways from a patient to healthcare workers, and then from healthcare workers to the grocery store clerk, the bank teller, daycare providers, and anyone else that they happen to come into contact with after work. How likely is this bacterial transfer to occur? In one study from a hospital in Connecticut, MRSA bacteria transferred from patients to healthcare workers’ uniforms at a staggering rate of 70%. And the worst part is, whether the patients and healthcare workers made physical contact had no effect on the numbers. Another study by Duke University Hospital found that the type of scrubs didn’t matter – traditional scrubs, scrubs treated with antibacterial material and scrubs made with silver alloy were all equally contaminated with MRSA and S. auereus after one hospital shift. If healthcare workers are wearing their uniforms home after a shift, everything that they touch becomes a potential point of bacterial transfer. Think about how many objects you touch in a day! This is a public health risk that medical facilities are taking by allowing healthcare workers to launder their own uniforms at home. Home washing machines don’t sufficiently clean medical uniforms. 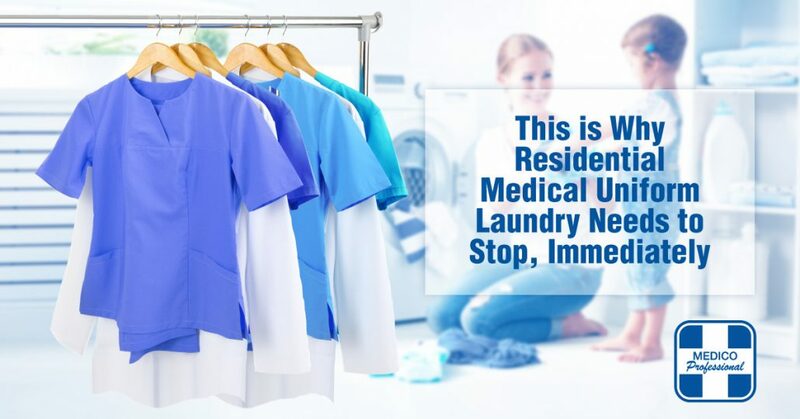 Not only does requiring your medical staff to take their uniforms home to wash create opportunities for bacterial transfer on the way to the washing machine, but home washing machines aren’t equipped to properly launder medical textiles. Work with a professional and certified medical uniform provider. Even after all this, the fact remains: your medical uniforms need to get washed somehow. The best and most hygienic way to get your medical uniforms clean is to work with a professional medical laundry like Medico. We have years of experience in the proper handling and laundering of medical textiles, with washing procedures that meet the highest standards set by the medical industry for hygiene and quality. Contact us today to learn more about how we can provide your medical facility with safe, hygienic medical uniforms and linens! Medico Opens State-of-the-Art Bulk Processing Facility! Medico’s Sequoia Plant is Now HLAC-Certified!